Here for this weeks offering are some wonderful photos from Claire at Unifly. She sells fabulously stylish travel accessories and has done a lot of travelling herself, so really knows her stuff. These photos are taken in Peru, home of the spud, (notice the potatoes in the foreground?) and show a lively market place, and then some potatoes laid out to dry, for use later on. Claire has got more great photos from Peru on her blog , and travel tips as well, so hop over and take a look and don't forget to check out those travel accessories while you're there. And thanks so much for letting me share these photos with my readers, Claire. 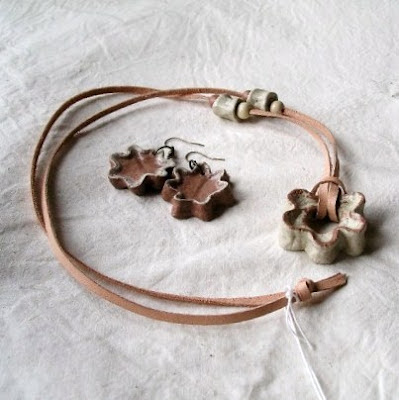 Well speaking of dried potatoes, what better time to show you a couple of pieces of my jewellery which, of course, are also made from dried potato! so you can see that the "rain drop" is intentional! Anyway, everyone, look forward to keeping in touch when I can, and just leave a message in the comments, or email me at earthapplejewellery@gmail.com if you want to get in touch. I may not answer instantly as Mum and I could be having some Mother Daughter time, but don't worry, I will get back as soon as possible and be back on track again in August. Cant wait to share some UK photos too! sun dried potatoes in an interesting concept. i wonder could we really do this. Enjoy your stay with your mum in the UK. We expect to see some British potato photos. Chips perhaps? Ha! Good idea Lori! I will work on it! Arrived about 15 hours ago. The good thing about jet lag is that I could enjoy the 4am dawn chorus as I was wide awake! Hi Jane, it is so nice to hear that you are going to visit your Mum. I'll bet she is very excited. I imagine that July is a lovely time of the year in the UK. Love your new jewelry, especially the last necklace.